Your Excellencies, Distinguished Guests, my Lords, Ladies, and Gentlemen. It is truly an honour to share with you the outstanding hospitality of that most kind Scottish Laird, Lord Lindsay. Last year my wife and I spent most of the time dropping such casual gems as, “did we mention we saw Cream in concert earlier this year.” For weeks now I’ve been subtly dropping lead bricks such as, “terribly sorry but I can’t join you on the 4th of July as I’m busy that night giving a speech at the House of Lords”. It is a great honour for an American to have the opportunity to talk in this humbling setting, even if it is “at the House of Lords” rather than “to the House of Lords”, but I found some reactions to the idea a little confusing. Despite mentioning the tradition of picnics and fireworks while dropping the fact that I’d be speaking on Independence Day, all of my British friends kept referring to their special day on the 4th of July as a huge bout of Thanksgiving. Of course, I speak not of Independence Day the film, nor of England’s freedom from 13 burdensome colonies, but of America’s freedom, had it remained part of the United Kingdom, from today’s Scottish Rule. But the biggest honour, and my greatest pleasure, is in thanking each and every member of the East Surrey Business Club and their guests for joining in this celebration of the special relationship between the UK and the USA on this most memorable day, Independence Day. Britain and America do have a special relationship, well worth celebrating, but I wondered why me rather than some more distinguished speaker with a better accent, but I realised why after I spoke with Geoffrey Sanderson. Geoffrey explained that East Surrey is blessed with some fine locations you use each year for events. East Surrey holds Hever Castle of Anne Boleyn, King Henry the Eighth and Astor family fame; Chartwell, home of Winston Churchill. But it was the Gresham connection that mattered. Titsey Place is closely linked to Sir Thomas Gresham, who in 1579 founded Gresham College where I have the privilege of being Mercers’ School Memorial Professor of Commerce. Then, at the other end of the scale using Gresham family symbol of the insect Sir Thomas Gresham himself made famous, and still found throughout the City of London, The Grasshopper Inn, home to the largest singles night in the southeast on a Friday! So what is the special relationship? Everything important I’ve learned in life I’ve learned from one book, my cheque book. And the special relationship has cost me, having lived in the UK for over a quarter of a century. But digging through my cheque stubs failed to produce much insight, except that things in London always cost more so, as an ersatz academic, I thought I should conduct some further research, and picked up a copy of a booklet from 1942, “Instructions for American Servicemen in Britain”, published by the US War Department and issued to American GIs going to Britain in preparation for the invasion of occupied Europe. It warned about the meanings of “bum”, explained British frugality, praised British toughness and distinguished reserve from unfriendliness. The booklet referred frequently to “Tommies”, so I wondered if we could start looking for that special word for the special relationship in slang. Everyone has a particular, endearing little phrase they use with those whom they love, “sweetheart”, “darling”, “dearest”. This is perhaps best seen at breakfast. An Australian, an American and an Englishman are breakfasting with their wives. The Australian asks, “pass the shugah, Sugar.” The American requests, “pass the honey, Honey”. The Englishman says, “pass the tea, Bag”. As you can see, by White’s definition virtually no one in the USA is a true Yankee, so no one takes offence. By way of contrast, living in the East End I can manage to take offence at “Yank”-”septic tank”-”seppo”. I far prefer the Chinese word for American, mei-guo-ren, “people of the beautiful land”. Sadly, insults have moved even further forward these days. The popular word to describe American on the internet sounds like the way a Westerner describes himself over here, “merrekin”. However, kids these days know what they’re doing so “merkin” is spelled “m-e-r-k-i-n”, and the internet kids know exactly what that means, a pubic wig. So perhaps we should look elsewhere for our special descriptive word of the special relationship. We even share oxymora – British and American intelligence. But I don’t think that “special relationship” is oxymoronic. It’s a real concept, and not just around tax time or battle time. Perhaps the word is trustworthy. But then I remember that both countries have helped found the professions based on mistrust, chartered surveying, chartered accountancy and chartered actuaries, just to get started. If we really want to add insult to injury, then we have to remember that while the common law legal system may be one of Britain’s finest exports, it keeps lawyers in holiday homes. The French always remarked that the sun never set on Perfidious Albion’s empire because God didn’t trust Brits in the dark. I suspect they have a similar expression for American pseudo-imperialism today. Perhaps the word is “spiritual”. Surveys show that one of the things about America that increasingly scares Europeans is the contrast between America’s secularity in law and overt evangelism in practice. Britain too is covered with religious fervour from Orkney’s stone circles to Stonehenge to Ely Cathedral, but then I remember why God gave such a non-religious people as the English cricket – so they could develop a sense of eternity. With a German wife I’m constantly reminded “don’t mention the war”, but perhaps that special word is “war”. Two World Wars have been fought shoulder-to-shoulder and many conflicts shared from the Falklands to the Gulf to Afghanistan to Iraq. There have also been a few confusing episodes from the War of Northern Aggression to China to Suez. Both have much to be proud of, and a few incidents to regret. We jointly celebrate the selfless efforts of our brave parents and grandparents, and, quite rightly, renew our gratitude for their sacrifices. Less remarked upon is that the British and the Americans have fought four wars against each other – the War of Independence which we’re kind of celebrating tonight, the War of 1812, and for those historians amongst you, the Northeast Aroostock War of 1838 and the Northwest Pig War of 1859. Fortunately, in two of the four wars there were no casualities, unless you count the pig. If I couldn’t mention the war, perhaps I could advance through technology, Vorsprung durch Technik as they say in the car trade. Britain and America share quite a bit of common culture in inventiveness and science, from Bacon through to those other Gresham professors Wren and Hooke to Faraday to Edison to the Wright Brothers to Crick and Watson, or Watson and Crick as you say here. Briton’s respect pluckiness and doughtiness, similarly Americans admire “can do” attitudes and Yankee ingenuity. However, having spent several years working in the UK Ministry of Defence’s research laboratories, I don’t want to get dragged again into “who invented it first” wars, though some of you may find it interesting to know that Farnborough’s Royal Aircraft Establishment was founded by the American showman, William Cody. I wondered if national mottos might help, but there’s quite a difference between “In God We Trust” and “Honi Soit Qui Mal Y Pense”. One is fairly obvious while the other seems to say “shame upon him who thinks evil of it” – or I’ll thump ‘em. I wondered about government. There are many shared government characteristics. My firm, Z/Yen Limited, is a special think tank and research organisation in the City of London where we work on a variety of topics with investment banks, technology firms and NGOs, including things such as trying to develop a Museum and Walk of Commerce & Finance for the public. 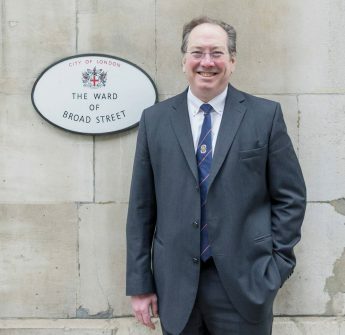 Because of our involvement in the City, I had the delight of being the Chairman of the Broad Street Ward Club a couple of years ago, a traditional post since at least 1278 and part of the oldest unbroken record of democracy, the City of London’s, closely followed by Parliament itself. I think of the Magna Carta and the Constitution, but the differences are very real too. One constitution is written, one impenetrable; one country has a monarch; one country is highly decentralised. Sometimes the differences are greater than the commonality. Let us be able to say to old England, this great-hearted, venerable [nation], you gave us our Fourths of July, that we love and that we honor and revere; you gave us the Declaration of Independence, which is the charter of our rights; you, the venerable Mother of Liberties, the Champion and Protector of Anglo-Saxon Freedom – you gave us these things, and we do most honestly thank you for them. OK, the Declaration of Independence loses rhetorical impact from this point on, going on to whinge quite a bit about George III’s taxation and unreasonableness, but there is an interesting point here, and that is how different cultures put different meanings into “freedom”, while some cultures share very similar meanings. This declaration was written from one people to another. Note this again, “a decent respect to the opinions of mankind requires that they should declare the causes which impel them to the separation”. It is a letter that could only be written from one people to another who shared so much in common. Peoples who believed in freedom of thought, freedom of speech, personal responsibility, habeus corpus and fair trials. On the Continent, we have the concept of “freedom to”. In Britain and the USA, we have the concept of “freedom from”. Or expressed another way, we tend to follow the libertarian maxim of “whatever is not explicitly forbidden is permitted”, while on the Continent, and in many other countries, people tend to follow the authoritarian maxim of “whatever is not explicitly permitted is forbidden”. Deeply held freedoms should lead not to shrill repetition that hollows out meaning, rather freedoms should lead to tolerance. Tolerance of others, respect for their opinions, their rights and their values. Even the summer torrent of US tourists, clad in plaid should be chatted to, their opinions respected, and then fixed. The Instructions for American Servicemen praised British fair play and tolerance. The British are a tolerant people – and for that we love them. They are tolerant to all foreigners, having us in their land, allowing us to make fun of them and to share their sense of humour and fair play. It may not look it in this 21st century, but Americans have their own version of tolerance. Past the embarrassment of US Customs, I think most visitors to America would agree that Americans are tolerant. The problem today is that Americans are losing their reputation for tolerance due to their own actions. Sure, the British Constitution may be unwritten, but an unwritten constitution that provides freedom and tolerance is worth infinitely more than a written constitution speaking volumes but offering only lip service. America is losing its reputation for tolerance not just in geo-politics, but also in business. Calvin Coolidge, the 30th President of the USA, popularised the idea that “the business of America is business”. Extra-territorial actions on corporate activities; global impositions such as Sarbanes-Oxley; absurd anti-money-laundering regimes that ignore the data they request; or unilateral anti-dumping confusion worthy of Peter Mandelson himself – America is in danger of losing its reputation for fair play in business. More and more the business of America is seen to be regulation, in America’s favour. Closely related to tolerance is a pragmatic view of the world. America seems to be in danger of losing its pragmatism and its tolerance. It is at just this point that I want to ask for your assistance. A special relationship is a bit like a marriage, only a spouse can tell a husband (sic) certain things. I think we need to have more constructive British criticism of America’s changing business practices. We should rebel against “taxation without representation”. We business people need to be vigilant against intolerance. Our cry for independence should be, “the only thing of which we are intolerant is intolerance itself”! Travel is fatal to prejudice, bigotry and narrow-mindedness … Broad, wholesome, charitable views of people and things cannot be acquired by vegetating in one little corner of the earth in all one’s lifetime. We must press the cases loudly and clearly with US businesses for fair trade, sensitivity to other cultures and respect for the environment. We must also press the case for America here, where one in five young Britons dislikes America ab initio. We must deepen, strengthen and complicate our Anglo-American clan. If we, Americans abroad and the Britons of the special relationship, can get American businesses improve their respect for other cultures, other governments, other legal systems and other taxation systems, then as Dan Quayle noticed, “the future will be better tomorrow”. Churchill said that a fanatic is someone who won’t change his mind and won’t change the subject. I won’t change my mind, but I can close the subject. Perhaps I was wrong to focus on Tommy Cooper and a single word – the special relationship is really founded on a mutual respect for two words – freedom and tolerance. Or as Tommy Cooper might say, a sincere “AMEN”. Honoured companions, it gives me great pleasure to ask you to be upstanding and drink a toast to – our Special Relationship.